This is a story which should be kept in the proper perspective. In the big history of the universe we know of, which we think, extends over a period of about 14 billion years, subatomic particles interacted to form a world which we perceive as matter and energy. Galaxies and suns and planets formed. On one of these planets; the third from the sun, Sol, a planet we call Earth, life began about 4 billion years ago. Life became more and more complex and developed the ability to grow from the chemicals and water from the earth and the gases from the air and the energy provided by the sun to evolve into beings based on cells living in symbiotic relationships. After life moved from the seas to the land and plants began to share the earth with animals, dinosaurs eventually gave way to mammals and primates in Africa about two million years ago evolved an upright big brained species called man. Man, about ten or twelve thousand years ago, discovered the practice of agriculture and formed cities and civilizations and began a population explosion using his thinking ability to become the species most dominant on the planet. Man eventually overspread the earth with some populating the western hemisphere by traveling through Asia and over the Bering land bridge and others forming civilizations in Europe. Eventually those from Europe came by sea to the western hemisphere and displaced those earlier inhabitants which had lived there for thousands of years. The earth is about 2/3 water and 1/3 land surface, now in seven continents. One of these continents, North America, is mostly a political entity called the United States formed in 1776 and within that country are fifty subdivisions called states. One of these in the middle of the eastern part of the continent is called Kentucky. Kentucky consists of 120 counties and one of these in the southern part of the state, a little to the east of the center near Tennessee is Clinton county with the town of Albany near the center of the county. This area was originally a part of the Cherokee nation but was settled by Europeans mostly traveling from Virginia in the latter half of the eighteenth century. Clinton County was formed on February 20, 1836 from portions of Cumberland and Wayne counties. The part of Clinton county northeast of Albany is dominated by Poplar mountain and by Sewell Mountain and nestled within the arms of these mountains to the south are Gwinn valley and Sugar valley and Duvall valley. To the east of Sewell mountain and to the southwest of Poplar mountain in Gwinn valley on the road to Sugar valley, water springs from a cool cave to form the head of Smith creek, a tributary of Spring creek which flows into Wolf river which eventually joins the Cumberland river on its journey to the Mississippi river and the Gulf of Mexico. That spring is known as Cook's spring. So in the vast reaches of time and space, this is the story of this small area of the earth in a time period of about 250 years. It is the story that I, a 66 year old man, believe to be true based on what I have been told and the research I have done and what I can remember. It is an incomplete story, but I write what I can of it in hopes that it may be of interest to some people in present and future generations. This area was a forest of mesophytic mixed hardwoods dominated by oak, hickory and chestnut trees and in the creek bottoms and lowlands sugar maple, beech, ash, walnut and yellow poplar with clear flowing streams and abundant wildlife. Although American Indians lived in the area and used it as a hunting ground it was never the center of Indian culture. 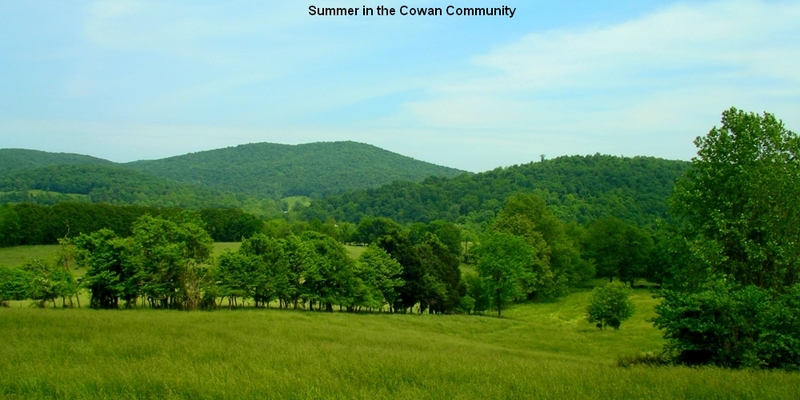 During the American Civil War a unit of the Union Army camped for a time in the Cowan community in the lower reaches of Gwinn valley to try to protect the inhabitants from Confederate incursions but the area was divided in its loyalities between the two sides and was subject to marauding bands of raiders loosely associated with the Confederacy. This is basically the story of hard working farmers clearing the forests in the gently rolling valleys and making a living for their families through tending crops and raising livestock and logging. On the detailed map above prominent landmarks and features are labeled and places where people lived (house sites) are numbered. These markings will be helpful in the discussions below. It might be helpful to download the larger version and either print it or show it as an image alongside your browser while reading the text below. Highway 350 is a state road which was the original road from the town of Albany about three miles to the southwest to Monticello about 20 miles to the east. 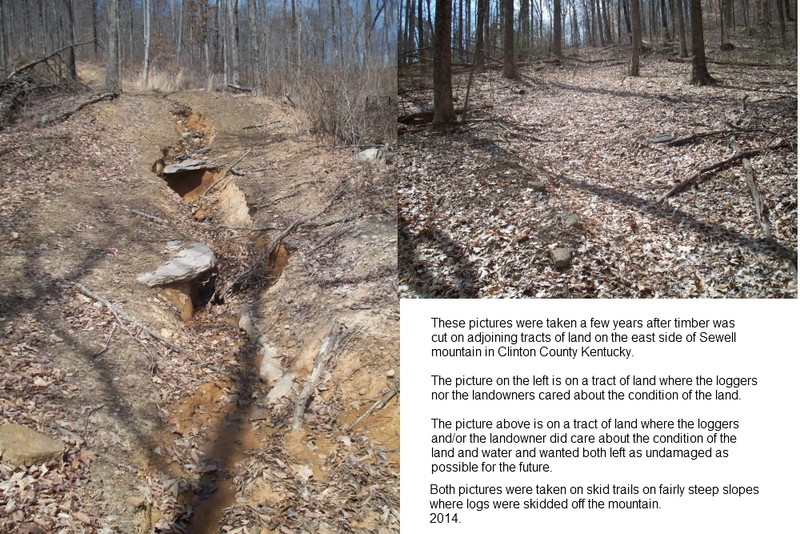 During most of this story it was a dirt wagon and horse road but in the twentieth century the road was graveled and then became the first paved road in Clinton County. My great grandfather said it was so crooked because it was built by a contractor who was paid by the mile. He smiled when he told me this. Please note that these were large farms and large families but many of the farms would have a main farmhouse and one or more smaller tenant houses at various places on the property either to rent or more likely to house farm workers hired for the farm. Many of the house places marked are these tenant houses. Most of these people who came from Virginia came to settle on 200 acre land grants probably earned by their service or their relative's service in the Revolutionary War. This includes Francis Pierce and the Cowan Brothers - James, William and Andrew and possibly David. One of the brothers or a relative who came with them was Thomas A. Cowan who married Margaret L. Long. Thomas A. Cowan was born in 1785 in Virginia. He was a son of James Cowan as was David Cowan and maybe the others also. Other families who migrated to Kentucky from Virginia probably between 1790 and 1810 included the Bristows, the Swopes, the Gwinns, the Parmleys and maybe the Guthries, Griders, Tuggles, Crocketts, Bertrams, Woods, Upchurchs and Braswells. Rachel Cowan was probably a daughter to David Cowan. She was born on May 5, 1808 according to her gravestone but some sources put her birth year in 1810 and some as late as 1818. "On the last day of May 1828, William Wood, commissioner appointed by the Cumberland County Court, held a public auction at the home of Andrew Cowan to dispose of James Cowan's estate. The widow Polly Cowan, purchased the two tracts, each containing 200 acres, which he owned." This James Cowan Jr. after he was killed by a tree falling on him. Click here for notes on the history of the Cowan family. 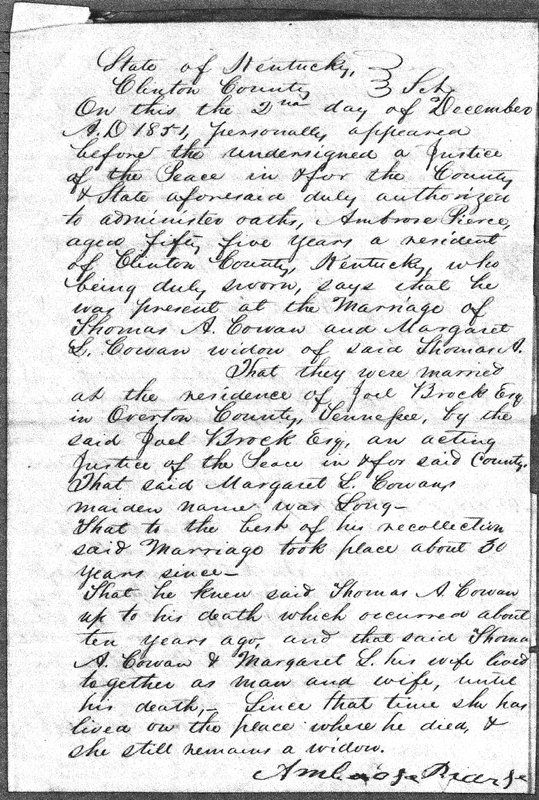 Documents pertaining to Margaret Cowan's pension for her husband, Thomas A. Cowan's service in the War of 1812. Affidavit of Marriage by Ambrose Pierce. Service Pension War of 1812 - Widow's brief. War of 1812 - Widow's Pension. James Cowan Sr. settled in the area where he started the Cowan Cemetery. He and his wife probably lived at the place marked "1" on the map. It is thought that they and their son, Thomas A. Cowan, and at least four of Thomas and Margaret's eight children born from 1824 to 1839 and two grandchildren are buried there with the last being buried as late as 1899. Click here to see the Cowan springhouse, a hand cut limestone block building. Two of Thomas and Margaret's daughters married Owen brothers. They were also brothers to Martha Owen, 2nd wife to Champ Ferguson, the notorious Civil War Guerrilla who was convicted of 53 counts of murder by a military court after the war and hanged in October 1865. Julia Ann S. Cowan and John B. Owen had a son in 1855. Their son, William E. Owen, died as an infant and was buried in the Cowan Cemetery. Another son, Robert A. Owen was born in 1861 and died in 1863 and is buried in Peolia Cemetery. They also had two girls named Martha and Louise and another boy they named John. In 1866 Julia committed suicide and was buried in Peolia Cemetery. In 1868 John B. Owen was hanged by bushwhackers, for not giving them money that he received for cavalry horses, and buried in Peolia Cemetery. L. Jane Cowan married Edward Owen, a preacher who was a cripple due to a bad back due to an accident caused by a runaway team, and they lived in Tennessee. Edward already had two girls by his first wife who had died. Ed and John built a house together - a long log cabin. It had three rooms - one to belong to Ed and Jane and their family. The middle room was the family room where they cooked and had a table and benches around the wall for chairs. It also had a loom and spinning wheel and other tools for making clothing. The third room belonged to John and Julia and their family. They had huge beds and probably trundle beds. After the death of his brother, John B., Edward and Jane raised the three children of John and Julia along with their family. After the war Edward and John planned to move to Kansas. In 1872 Edward formed a wagon train of six families, 18 wagons and 72 people and they along with Martha Owen Ferguson and others left to settle in Kansas. Margaret Cowan and ten of her grandchildren went with the wagon train. It is said that she walked most of the way to Kansas. Martha Owen, daughter of John and Julia was said to have been fourteen years old on this trip. In Kansas she later married a Denney. They are buried in Oak Hill Cemetery at Elk City Kansas. 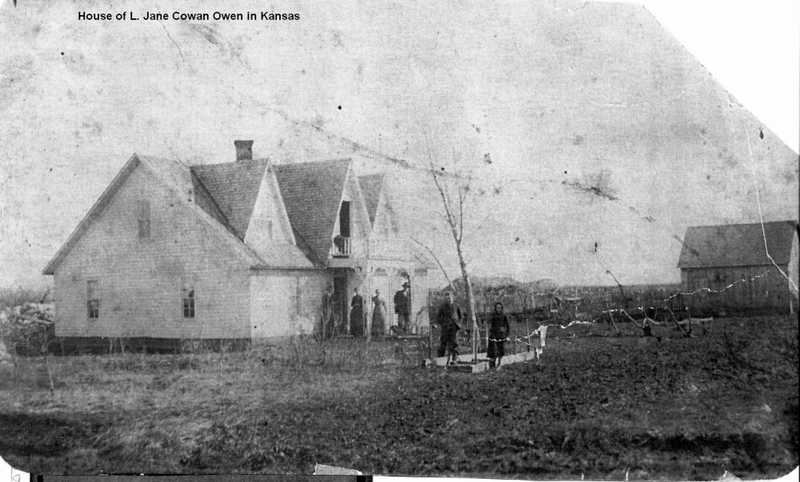 Click here for a picture of L. Jane Cowan Owen's house in Kansas. When Margaret Cowan went to Kansas with the wagon train she left behind three sons in Kentucky, David C. (1824-1892), William J. (1826-1890), and James V. (1836-1874). 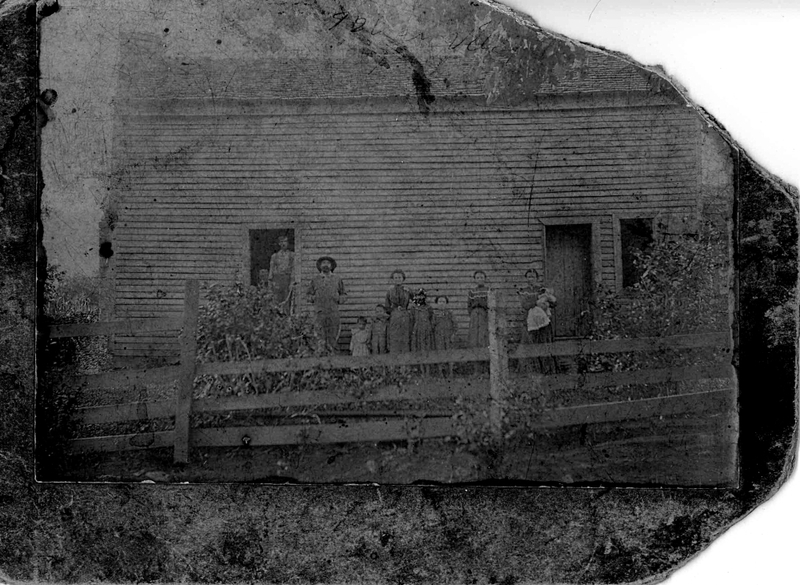 In 1878 Margaret was back in Kentucky probably having returned after the death of her son, James V. She probably was living in her house on the Cowan farm where her son William and his son, Bill Jr., and probably David C. still lived. Later Jane returned to Kentucky and brought her mother back to Kansas with her. Margaret is also buried in Oak Hill Cemetery in Kansas. William is probably buried in the Cowan Cemetery. His mother, Margaret, died in 1892 in Kansas. The last person buried in the Cowan cemetery in 1899 was William J. "Bill" Cowan, Jr., grandson of Thomas and Margaret Cowan. He was a farmer, with his family in the old Cowan community until his death of fever. He said, "I want to be buried in the field that I have worked my entire life". His wife, Sarah Susan Wray Cowan, said, "They will plow over you." He replied, "I don't care, I want to rest in the land I love." As told by his daughter, Fratie Ellen Cowan Sloan. Later on that entire cemetery was "plowed over". Sarah Cowan had five children and after her husband's death she moved with her children back near where her father Floyd M. and mother Artemia Wheeler Wray lived on the Pikeview Concord Road (hwy 1775). Her son, Edward, remained living there with her until Sarah's death in 1939. In the 1910 census, one of Sarah Cowan's neighbors was John J. Cash, 54 years old, and his wife, Lizzy, 51. They had four children living with them; Hershel, 21, Perry, 18, Esther, 16 and Eula, 10. Sarah's children living with her were John 19, Floyd H., 17, Edward 16, Fratie, 13 and Antha, 11. In contrast the 1900 census showed Sarah's children as John, 11, Herbert, 8, Edward, 6, Fratie, 4 and Antha, 2. It gives Sarah's age as 32. Isaac Pierce was a Virginia soldier in the Revolutionary War. His son Francis was born in August 1760. In 1782 Francis Pierce married Elizabeth Lewis. On March 8, 1808 this couple had a son they named Lewis. Francis too came to Kentucky to the same area in which the Cowans settled. Their son, Lewis, married Rachel Cowan. From 1836 to 1851 Lewis and Rachel had eight children. Six of their girls married and started families which would figure in the future of the community and the county. The surnames of their families were Parmley, Guthrie, Grider, Cook, and Tuggle. 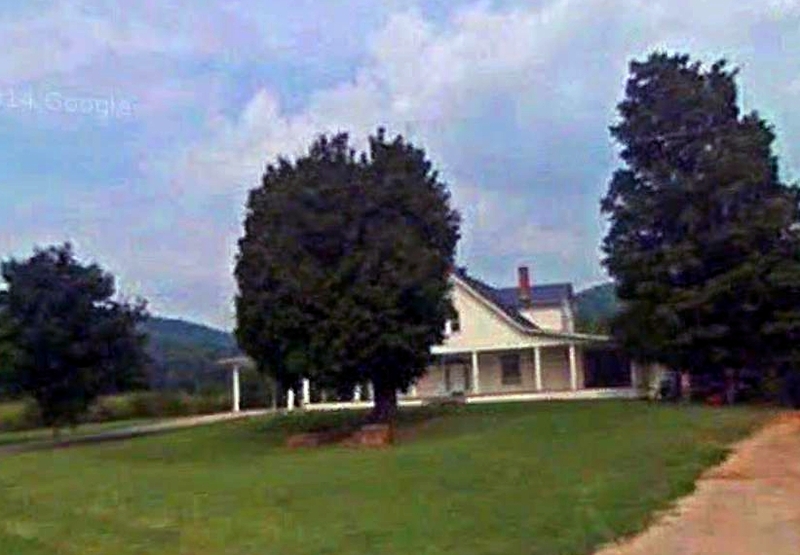 It is believed that the Lewis Pierce family home was at location 2 on the map or nearby. Jack Ferguson says that Francis Pierce's 200 acre land grant was near Central Union Church on the land later owned by his great grandson, George Grider. 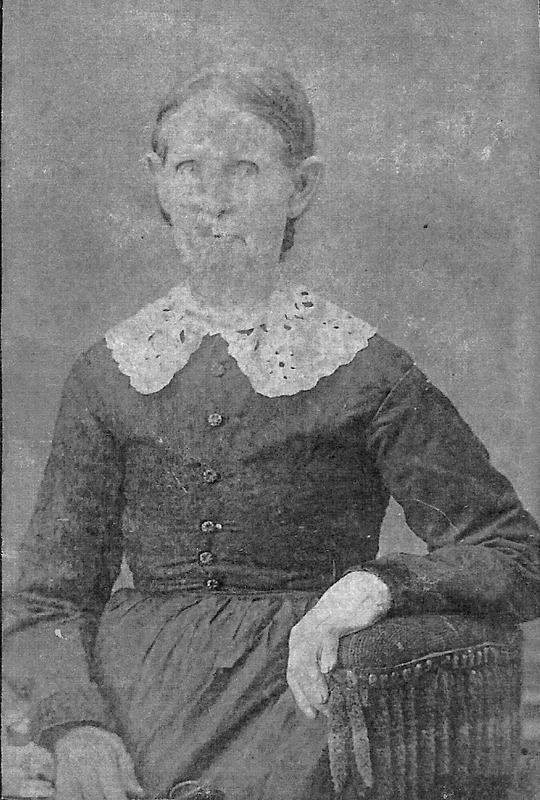 Elizabeth Ann Pierce married James Smiley Parmley and between 1858 and 1877 they had eight children. Five of the girls married and also started families which figured prominently in the future of the community and the county. The surnames of their families were Crockett, Bertram, Wood, Upchurch and Braswell. The Parmleys lived at location 2 on the map. James Parmley's will was written November 9, 1916 and witnessed by O. S. Grider and F. W. Parrigin. It is recorded in the Clinton County Clerk's office in Will Book 2, page 221. James Parmley left all he owned to be divided equally among his children after the death of his wife. Except, he wrote, "Thomas Parmley and Georgia Vitatoe, children of my deceased son, James R., are excluded except for $100 owed to me by Georgia Vitatoe, I give that to her. The note she signed for me was lost when my house burned." "The executors of my will are to be W. F. Upchurch and S. A. Wood, who married my daughters", he said. It is believed that the Gwinn family home was at location 15 on the map. *** Note: It is believed that many of George & Jane GWINN's children and his parents, are possibly buried in this cemetery, attributing for the number of unknown gravestones. Due to the overgrowth of foliage, reeds, and trees, we are currently unable to determine locations. 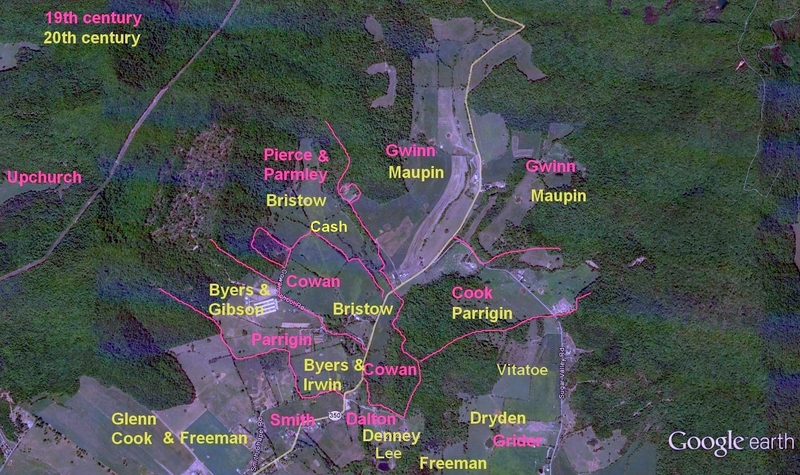 The family name has been GWINN every since 1770, when George's grandfather, James Sr. GWINN, b. c1744, Augusta Co., VA, whom married Nancy CARLILE, entered the frontier of what is now known as West Virginia. Prior to 1770 the name was spelled GWIN, (see descendants of Robert GWIN b. c1717-1785 and Jean KINCAID). In respect for his grandmother, Nancy (CARLILE) Gwinn, George named one of his children, Alfred Carlisle GWINN. George GWINN, was the 4th child born to James "Jr." GWINN "II" and Mary "Polly" FROGGE. His parents moved to Paoli Twp, Cumberland (now Clinton) Co., Kentucky about 1812, because James' sister & brother-in-law, Nancy (GWINN) & George SWOPE & their family had been in Cumberland Co., KY since 1803, along with other Monroe Co., VA(now WV) families. George married Jane DAVIS on 3 Feb 1825, in Alpha, Wayne (now Clinton) Co., Kentucky. They received a 200 acre land grant, approximately 3.5 miles NNE of Albany, along Smith Creek in Dec 1827, on which they settled and raised a family of 10 children and ONE nephew. Luvisa (GWINN) Miller, (b. 26 Feb 1826, Cumberland (now Clinton) Co., KY; d. 11 Jun 1860, Clinton Co., KY). James M. GWINN "constable", (b. abt. 1828, Cumberland (now Clinton) Co., KY; d. bef. 1859). John M. GWINN, (b. abt. 1830, Cumberland (now Clinton) Co., KY; d. bef. 1869). George W. GWINN, (b. 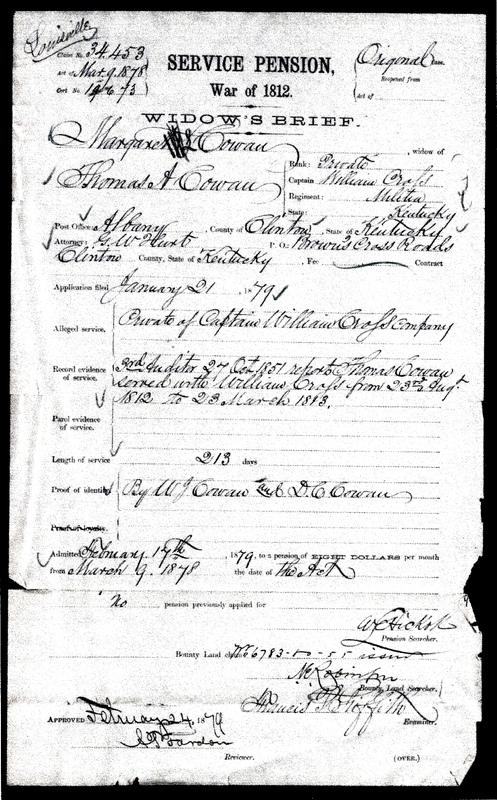 28 Nov 1832, Cumberland (now Clinton) Co., KY; d. 18 Sep 1920, Clinton Co., KY). Sylvester L. GWINN, (b. abt. 1835, Cumberland (now Clinton) Co., KY; d. bef. 1879). Cyrus W. GWINN, (b. abt. 1837, Clinton Co., KY; d. 24 Sep 1855, Clinton Co., KY). William Rice GWINN, (b. abt. 1842, Clinton Co., KY, d. 12 Feb 1859, Clinton Co., KY). Alfred Carlisle GWINN, (b. 9 Feb 1845, Clinton Co., KY; d. 5 Jan 1916, Anthony, Harper Co., Kansas). Martha E. GWINN, (b. abt. 1847, Clinton Co., KY, d. unknown). Mary Ann GWINN, (b. abt. 1852, Clinton Co., KY, d. unknown). ** "nephew", Francis Marion GWINN, (b. abt 1829, Cumberland (now Clinton) Co., KY, d. bef 1890). (son of David Gwinn (b.1799,VA) and Rebecca OWENS (b.1797,KY), a relationship that occured after Joseph GWINN left his wife, in 1828. (DNA was "proven", Family Finder, Autosomal Testing matching descendants of Pastor Rueben Pickett Owens & Sarah "Sally" Lockhart to descendant F.M. GWINN). George was a prominent land owner and farmer, teaching his children the trades of lumbering, carpentry, blacksmith, and farming. George died 1 Aug 1873, in Clinton Co., KY, and was buried in the family cemetery. Six days later his daughter-in-law, Elizabeth Gibbons (Wood) Gwinn died, and was buried next to her father-in-law. George's wife Jane (Davis) Gwinn died 2 Apr 1876, and was buried next to Elizabeth. This was mentioned to clear up confusion when viewing the plots. Elizabeth Gibbons (Wood) Gwinn, was a daughter born 13 Apr 1845, in Clinton Co., Kentucky, to Reuben Bayless WOOD (b. 1805, KY) and Elizabeth GIBBONS (b. 1803, KY). Elizabeth was married on 26 Sep 1866, in Clinton Co., Kentucky to George W. GWINN (b. 1831, KY), the son of George GWINN (b. 1801, VA) and Jane DAVIS (b. 1809, KY). 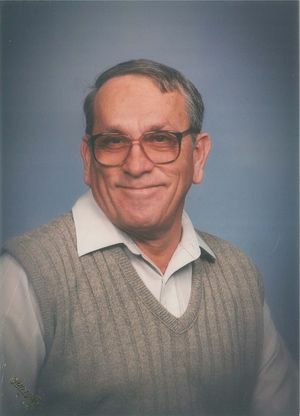 George A. GWINN, (deaf), b. 4 Aug 1868, Clinton Co., KY; d. 16 Jun 1940, prob. Hayes, Clinton Co., KY.
Mary A. (GWINN) Maupin, b. Nov 1870, Clinton Co., KY; d. 11 Nov 1919, Nicholasville, Jessamine Co., KY.
Reuben Wood GWINN, 12 Oct 1872, Albany, Clinton Co., KY; d. 10 May 1949, Boyle Co., KY.
Six days before Elizabeth (WOOD) Gwinn died, her father-in-law had also passed away. Elizabeth's husband and mother-in-law decided to have Elizabeth buried next to her father-in-law. This was mentioned because of the confusion of "two" gravestones with identical dates, one of which is beside her father-in- law, and one is combined with her husband. We must also remind everyone that Elizabeth Gibbons (WOOD) Gwinn's husband George W. (b.1832), remarried after the death of his 1st wife, to Elizabeth's cousin, Mary Elizabeth WOOD, b. 1 Sep 1852, of Fentress Co., TN, the daughter of William Cargile WOOD and Luverna S. "Luvina" McGEE. It is believed that George W. GWINN's 2nd wife "Mary E." was not buried in the GWINN Family Cemetery, because an immediately gravestone was not located of her. George W. GWINN, was born 28 Nov 1832, in Clinton Co., Kentucky, the fourth child and a son of George GWINN (b. 1801, VA) and Jane DAVIS (b. 1809, KY). George W. GWINN was first married on 26 Sep 1866, in Clinton Co., Kentucky to Elizabeth Gibbons WOOD (b. 1845, KY), the daughter of Reuben Bayless WOOD (b. 1805, KY) and Elizabeth GIBBONS (b. 1803, KY). George W. GWINN's father died on 1 Aug 1873 and six days later, one 7 Aug 1873, George W. GWINN's wife Elizabeth (WOOD) Gwinn died. George W. had his wife buried beside his father. This was mentioned because of the confusion of "two" gravestones with identical dates, for Elizabeth (WOOD) Gwinn, one of which is beside her father-in-law, and one is combined with her husband. About 1888/1889 George W. GWINN was married to a second wife, "Mary Elizabeth WOOD", b. 1 Sep 1852, of Fentress Co., TN, the daughter of William Cargile WOOD and Luverna S. "Luvina" McGEE. It is believed that she was a cousin of George W. GWINN's 1st wife. Also, it is believed that George W. GWINN's 2nd wife "Mary E." was not buried in the GWINN Family Cemetery, because an immediately gravestone was not located of her. Jane DAVIS married George GWINN on 3 Feb 1825, in Alpha, Wayne (now Clinton) Co., Kentucky. They received a 200 acre land grant, approximately 3.5 miles NNE of Albany, along Smith Creek in Dec 1827, on which they settled and raised a family of 10 children and ONE nephew. Jane's mother, Martha (unknown) DAVIS, lived with the family through the 1840's, 1850's & 1860's until her death (calc. before 1869). **"nephew", Francis Marion GWINN, (b. abt 1829, Cumberland (now Clinton) Co., KY, d. bef 1890). (son of David GWINN (b.1799,VA) and Rebecca OWENS (b.1797,KY), a relationship that occured after Joseph GWINN left his wife. (DNA was "proven"). Luvisa GWINN was the 1st child born to George and Jane (Davis) GWINN, on 26 Feb 1826, in Cumberland (now Clinton) Co., Kentucky. Luvisa was married on 6 Mar 1850, in Clinton County, to Dr. Otho "Ottis" Miller, and birth two children, George Francis MILLER and John Gwinn MILLER of which "both" died in infancy. Luvisa died 11 Jun 1860, in Clinton Co., KY. she was buried at the GWINN Cemetery, along Old Mtn. Rd., Albany, Clinton Co., KY.
*** Note: It is believed that her two children are possibly buried in the same cemetery near their mother, but due to the overgrowth of reeds and trees, we are currently unable to determine the location. In November 1940 the Gwinns sold 1040 acres of land on Poplar mountain to Wendell Maupin for $5,000 and in December 1949 Wendell Maupin sold that land to Bruce Sloan, doing business as Sloan Coal Company, for $7,000. When asked why he sold the land so cheap, Wendell said, "I just couldn't turn down two dollars an acre profit." Coal was strip mined on top of the mountain by Becknell-Grace Coal Company from Manchester, Kentucky in the 1970s. In August 1942 the Gwinns sold Wendell Maupin the 670 acres remaining of their farm. The Gwinns signing the deed were George, Gladys, Herbert, Myrtie P., Nina, and R. W. This included 5 acres they had obtained from Elizabeth White - deed book 2, page 324. On Wendell Maupin's death this farm went to Wendell and Lillie's son, Howard, and their son, Marvin, inherited the Maupin family farm between Albany and the Tennessee state line at Static. Wendell and his family lived at the location marked 15 on the map and Howard built a house across the road. They also had a tenant house at the place marked 16 and Howard and his wife, Jimmie Burchett's, son Carter and his wife, Susan Upchurch, lived there for a while. After Wendell died in 1987 Carter and Susan remodeled his house and moved there. Lillie had preceded Wendell in death by about 13 years. The Wendell Maupin house as it appeared in recent years. This house may have been built by the Gwinns. In 1906 the land was sold by Henry Stinson to G. C. Clark and Fred and Antha Elrick. In 1910 it was sold to Armilda J. Byers, wife of James T. Byers. In 1920 Armilda Byers sold it to S. J. Wray. In 1921 S. J. Wray sold the farm to J. H. and Lula Cash. J. H. Cash sold 4 1/2 acres at the location marked 13 to Jake Parrigin. In 1925 the Cashs sold the remainder of the farm to Welby R. Gist. In 1936 Welby Gist sold it to J. T. Catron who sold it to W. B. "Bal" Vitatoe. 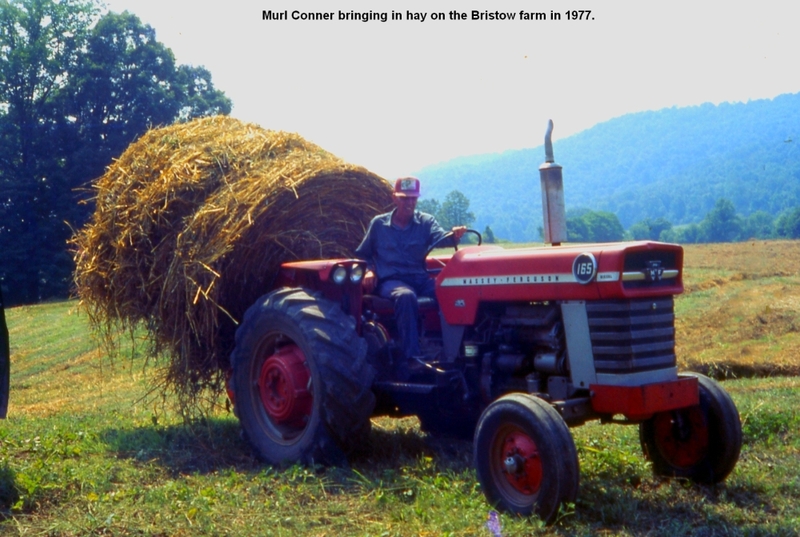 Later the farm was inherited by Bal Vitatoe's son, Kermit, who sold it in the later part of the twentieth century to Paul Conner, son of Murl Conner. Paul Conner sold it to Wayne Parrigin, son of Harold Parrigin. After the turn of the century it was sold at auction and purchased by Carter Maupin, son of Howard Maupin. By this time the tract also included the 4 1/2 acres that had been sold to Jake Parrigin. 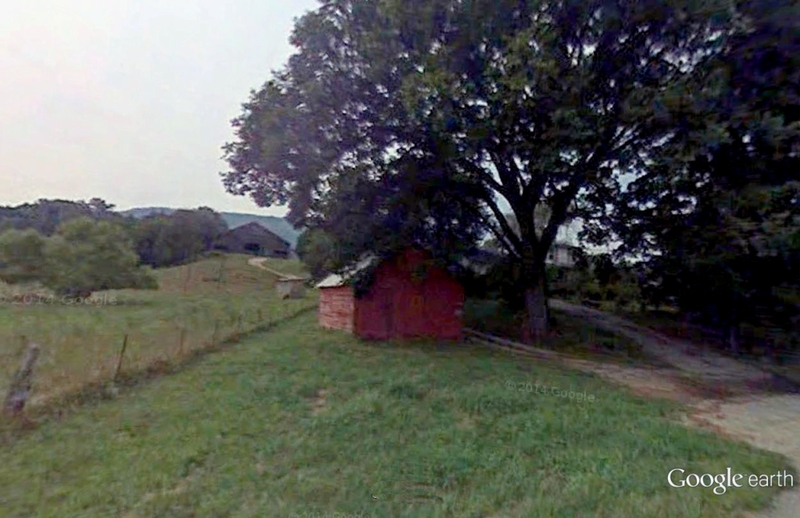 So that farm was reunited with the Gwinn farm, now owned by the Maupins, from which it was originally severed. I believe that James T. Byers and his wife, Armilda, lived in the house that was at the location marked 9 and farmed the land from 1910 to 1920. That house burned when the land was owned by Wayne Parrigin as did a barn on the farm. The Byers had a tenant house at the location marked 12. It was torn down after the turn of the 21st century by either Paul Conner or Wayne Parrigin. Dan Davis was an orphan living in Duvall Valley near the underground coal mines there. He lived with a foster family who used him as slave labor. Dan was born in 1891 and his father, Taylor James Davis, died in 1894 and his mother, Sally A. Hughes, died in 1901. When Dan got old enough he left his foster family to find work and live on his own. He ended up living in the Byer's tenant house and probably as a workhand on their farm. The Byers had two daughters, Geneva and Mary. Geneva was 4 years younger than Dan Davis and she was nine years older than her sister, Mary. Dan got pneumonia and I was told that a doctor operated on him by coal oil light in the tenant house, removing one lung. I'm not sure if anethesia was used, but the surgery was primitive at best. Needless to say Dan was slow to recover from such an ordeal. His recovery probably took from one to two years. During this time he was cared for and nursed back to health by the young girl, Geneva Byers. Afterward Dan and Geneva married and moved to Richmond, Indiana to find work. Geneva's sister, Mary, married Ode A. McGuffey. Dan and Geneva had a son they named Donald and in 1934 Geneva was sick and died. In Richmond the Davis family lived near and became friends with another family from Kentucky, Roy Bristow's family including his wife Lillie and their sons Jesse and Larry. Roy Bristow died from complications (possibly a twisted bowel) from an automobile accident in 1930. Lillie moved with her boys back to the family farm in Wayne County Kentucky but it was the middle of the great depression and they were destitute. After Geneva died in 1934, Lillie married Dan Davis and moved back to Richmond, Indiana. Dan worked for the city gas company and Lillie worked as a clerk in a department store and they raised the three boys, Donald Davis and Jesse and Larry Bristow. On a cool Monday morning on September 11, 1961, Dan got up before Lillie, went to the back porch, sat on the edge of the porch, put a pistol to his head and committed suicide. He is buried in the Elk Springs cemetery in Monticello Kentucky. 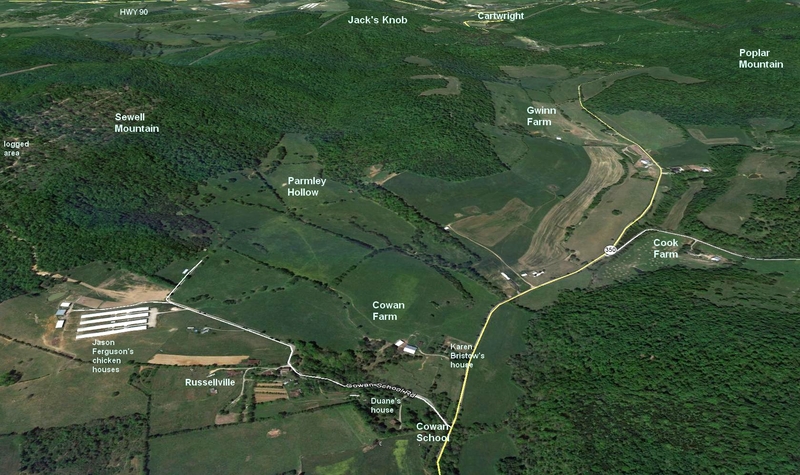 Lewis Pierce's daughter, Martha Jane (1847-1911), married Hiram P. Cook (1842- 1909) and they lived at the location marked 10 on the map across the road from a big spring coming out of a cave. That spring is the head of Smith creek. Hiram and Martha Cook had a son they named David Lewis. He was born on September 10, 1876 and lived until July 23, 1919. He was a doctor and a World War I veteran. He married Mary Alma Burchett (1882-1959) and they had four children: Ethel Reba (1902-1989), Frank Phillips (1910-1912), Glenn B. (1913- 1988), and Charlie D. (1916-1942). His wife remarried after his death and left the family farm. Frank Phillips Cook died as a child and Charlie D. Cook was killed along with his infant daughter, Mary Franklin, in a house fire on February 17, 1942. He was married to Franklin Hancock. I understand that the house that burned was located near the place where Smith Creek crosses under state highway 415, known as the Duvall Valley Road. I was told this by Otha Catron who lived just across the creek from there. When Charlie D. died, Franklin was pregnant with their son and when he was born, she named him Charlie D. for his father. 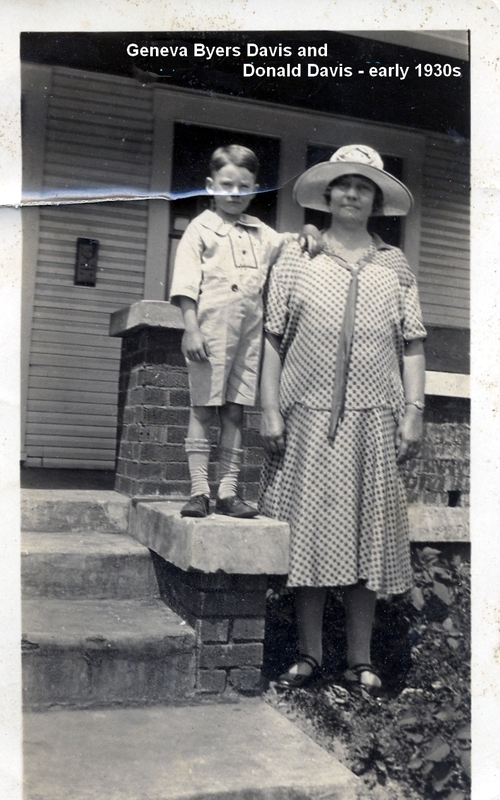 The younger Charlie D. was then raised mostly by his grandmother, Alma, and his Uncle Glenn. Glenn married a woman named Roberta Briggs and they had a daughter they named Judith. 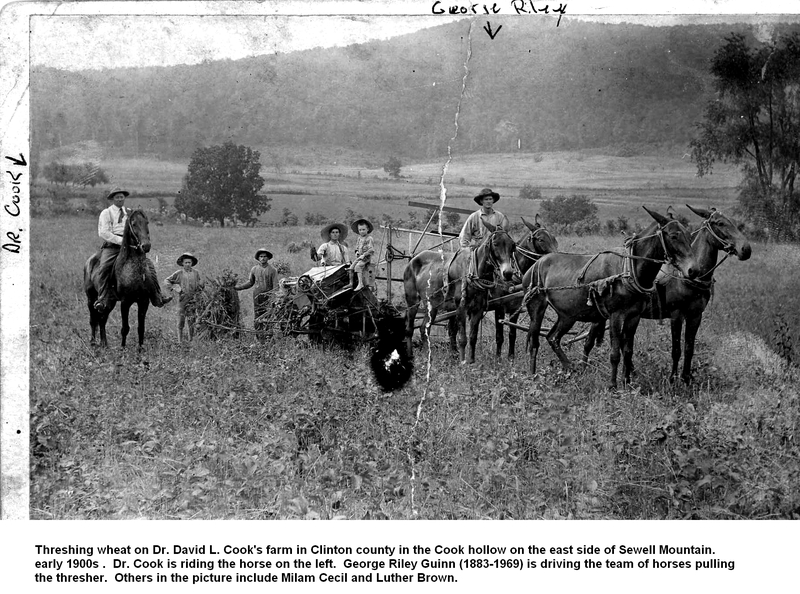 Glenn Cook and his family lived at the farm labeled Cook hollow on the map. 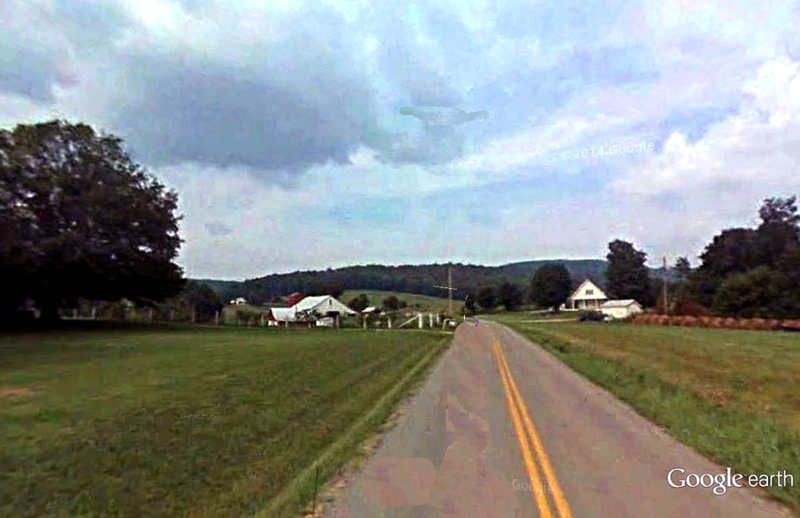 That farm was where Dr. David Cook lived and after his death Glenn lived there and Ethie lived at the Cook Spring farm. Glenn was born on August 26, 1913 and lived until September 26, 1988. That farm was sold to Dr. Larry Mason and later to Noah and Orville Freeman. Ethel Reba Cook, known as Ethie, married James W. Parrigin (1892-1949). He was the son of F. W. Parrigin (1863-1944) who owned the farm at the location marked 7 and Agnes Bell Hopkins (1864 - 1908). James and Ethie had three boys, James Cook (1924-2011), Glenn David (1930-1984) and Harold G. (1934- 1994). 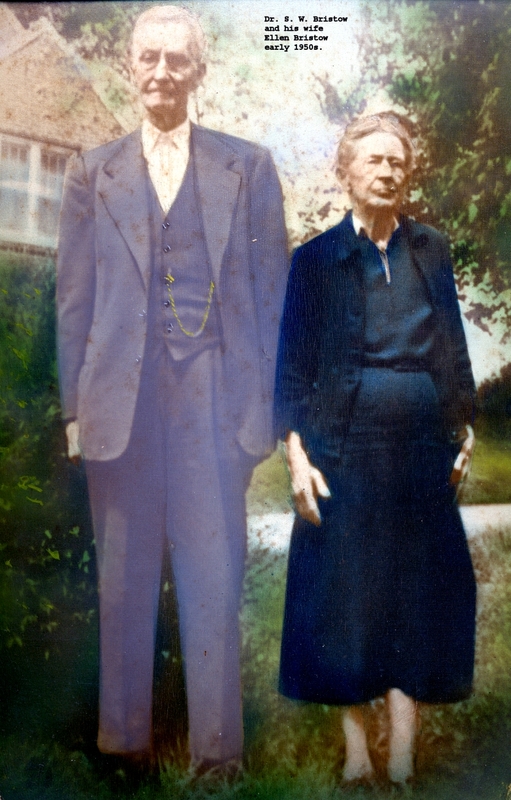 When Ethie's parents died James and Ethie remained living at the Cook farm across from the big spring. James Parrigin was a school teacher and taught at Cowan school in about 1920. Glenn Cook was also a teacher for a while. James hanged himself in 1949. James Cook Parrigin served in World War II. He married Pauline Moody and was an insurance agent in Albany and resided in Memphis, Tennessee and in Ripley, Ohio before settling in Bowling Green, Kentucky. Harold Parrigin's wife was named Ruby and they had sons named Harold Wayne and Glenn David plus she had a son named Tommy Blevins and perhaps other children including one named David Green. 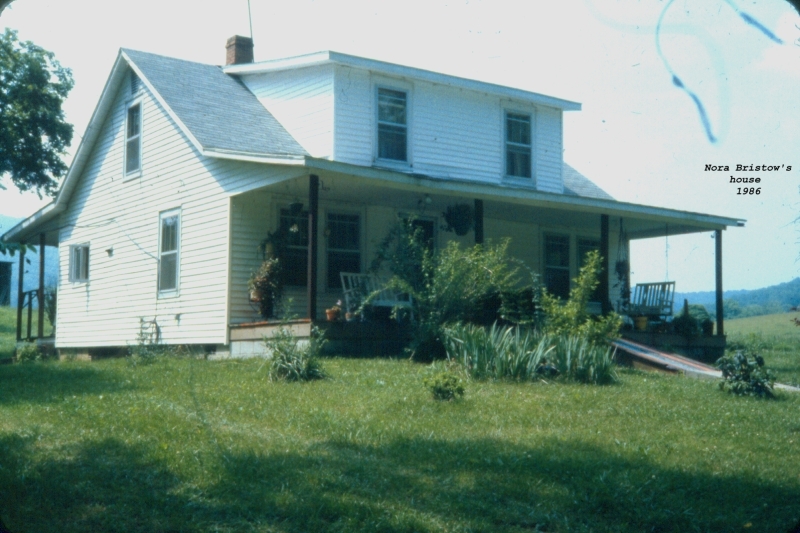 Harold and Ruby lived on the Cook farm with Ethie and remained there after Ethie's death until Harold died in 1994. Ruby E. Parrigin (1930-2007) remarried and moved away after Harold's death. Harold and Ruby are buried in Memorial Hills Cemetery but the rest of his family is buried in Albany Cemetery in Albany. Glenn David Parrigin was a corporal in the Korean War and moved away from the area as a young man. He married Bonnie Leah Upchurch (1931-1999). I think they had a son named Jim. After Harold and Ruby's deaths the farm was eventually sold to Dave Mackewich and his wife Eli. The location marked 11 on the map was once a tenant house on the Cook farm but it burned in the early 1960s. 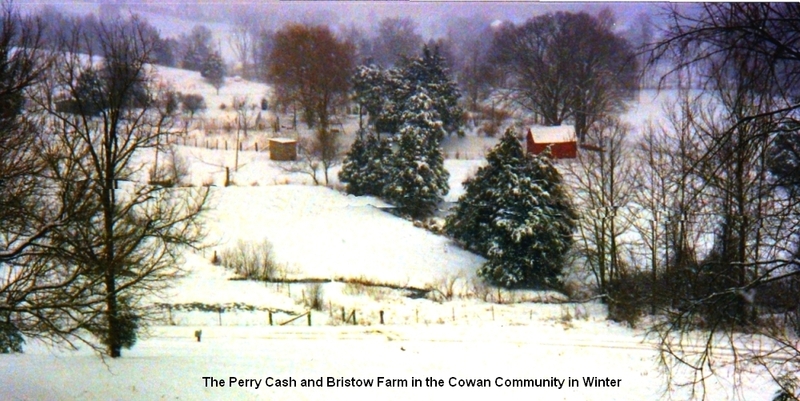 About 1921 Perry Cash bought several tracts of land totaling about 700 acres in the Cowan Community. This included the Cowan and the Parmley land. He and his wife, Eula, lived there until he sold the land to the Bristows in 1944. He farmed and ran a country store and a sawmill. He is said to have bootlegged from his store. 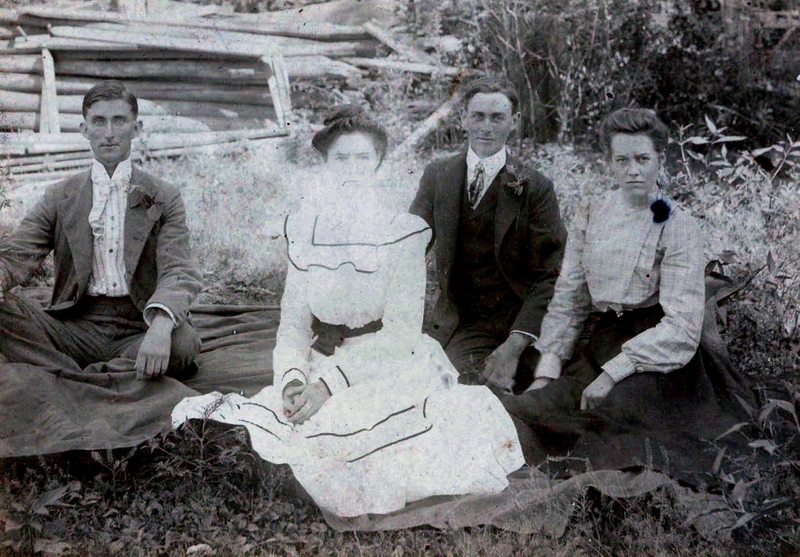 Perry and Eula had three sons and one son, Herman, was killed while logging in the mountains. My ancestor, Leven Bristow, migrated to Clinton County from Virginia in 1792 at the age of 15. My great grandfather, Samuel William Bristow, was a rural doctor and community leader in both Clinton and Wayne counties throughout the first half of the twentieth century. My grandmother was widowed and left to raise two children on a farm in Wayne County in 1930 at the beginning of the great depression. My father, after fighting in the Pacific theatre throughout World War II worked in a factory in Indiana for a few years and moved to the family farm in Clinton County in 1950 and lived there until his death in 1975. My wife, Eva Harlan, is also a native of Clinton County. We have two sons and two granddaughters. Perry Cash sold his 700 acre farm to Leo Sewell in 1944. Leo Sewell sold the farm to Dr. S. W. Bristow a couple of months later for a profit of about $1000. Dr. Bristow's grandson, Jesse W. Bristow, returned from military service in the Pacific theatre fighting in World War II and was living in Richmond, Indiana with his wife, Nora, and son, Duane, and working in a factory there. Dr. Bristow sold the farm to him at a bargain price to entice Jesse to return to Kentucky to live. Dr. Bristow and his wife, Ellen, were getting older and he wanted a relative nearby in their old age. 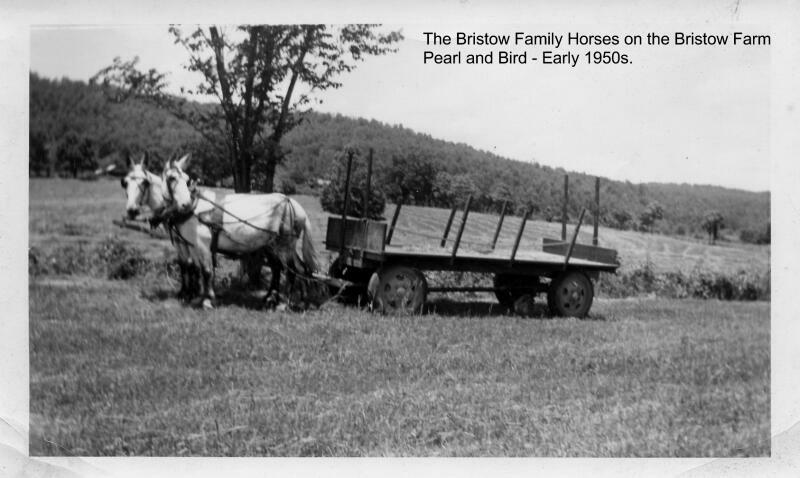 In 1949 Jesse and Nora Bristow returned to Kentucky and lived with Dr. Bristow and Ellen in their house in Albany while Jesse was building a house on the farm replacing the house where Perry Cash had lived. Haskell Dalton and his boys helped Jesse to build the house. 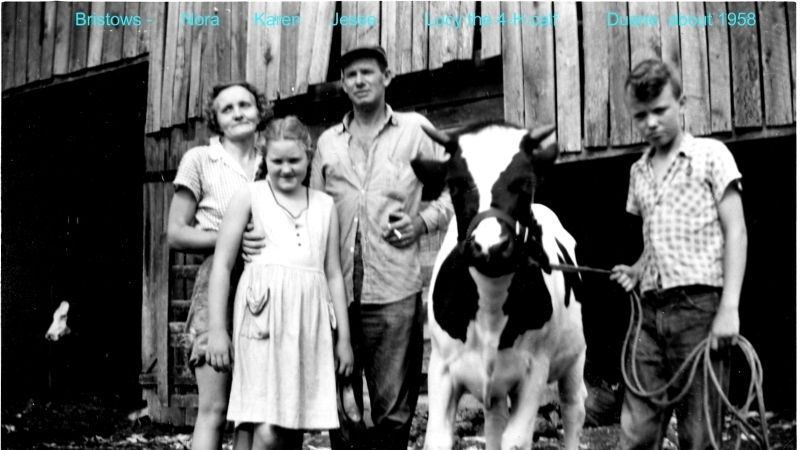 In 1950 Nora Bristow had a daughter she named Karen Sue and Jesse and his family moved into their new house. Dr. Bristow died in 1954 and his wife died in 1958. Growing up on the farm, I remember that my father, Jesse, hired the neighbors to help with farm work and his children also helped as they got older. Some of the neighbors who worked on the farm at various times included the Smiths, the Daltons, Cy Polston, Cecil Daniel, James Cummings, Palmer Abbott, and he sometimes traded work with the Maupins and with Gene Wade and with Kenneth Wisdom. 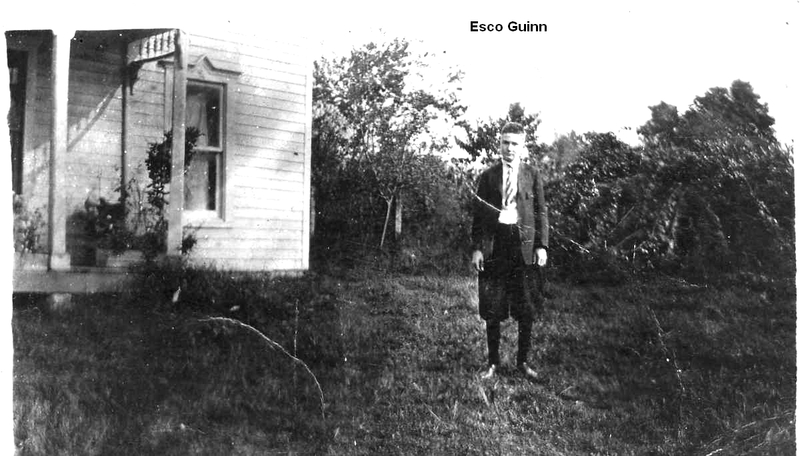 His children attended the Cowan one room school until it was closed in 1960. Besides this, there were two tenant houses on the farm. Some of the tenants I remember living there were Woodrow Gibson and his family, Paul Pruitt (1933-2010), a one armed single man and Sam Rains also known as Sam Terry and his wife, Ora, and their children I remember Rosie, Louise, and Johnny but they had other younger ones. Later the house was rented to a recluse named Columbus Wright who was paranoid and kept his wife secluded in the house. The Wrights were cash renters and did not work on the farm. Even later my great uncle, Laurel Hopper, who was retired from the Navy and on probation from prison lived in the house at location 2 in the Parmley hollow. Other renters who lived in farm tenant houses in the valley at that time included Joab Johnson and his son-in-law whose name, I believe, was Perry Hall, Pete Beaty and his three boys, Travis, Otis and Carlos, Newell Hogan, Reuben Huckaby, Jim Owens and his family, and there were others whose names escape me at the moment. Jesse Bristow also owned a laundromat in Albany in the early 1960s and in the late 1960s went to Indiana to work when farm returns were too low to support the family. This was after his children left home. Jesse leased the farm to Murl Conner and his wife, Pauline, while he was working in Indiana. Jesse's wife, Nora, had multiple sclerosis and diabetes and eventually became confined to a wheel chair and after Jesse's death in 1975 was cared for by her children, Duane and Karen, for several years but had to spend the last six years of her life in a nursing home before her death in 1994. 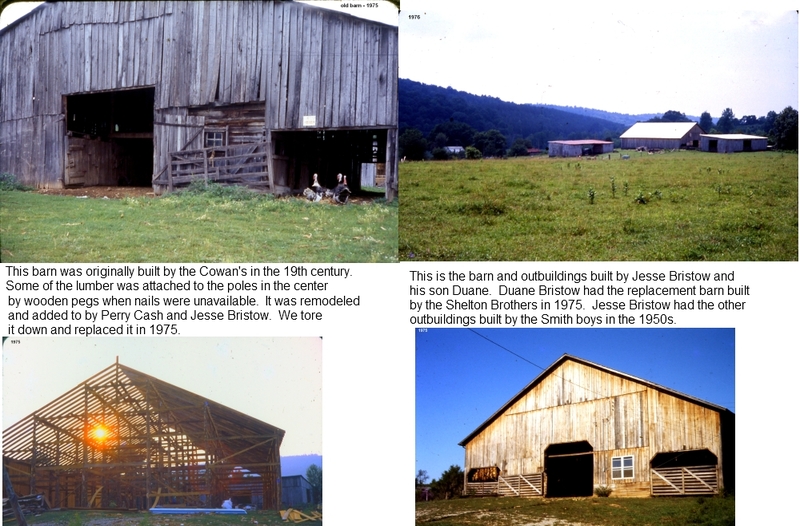 The farm was incorporated as Bristow Farms, Inc. in July 1975, deed book 57, page 238 and in 1993, Bristow Farms bought out the interests of Jesse's brother, Larry E. Bristow. Karen Bristow attended the University of Kentucky graduating in 1971 and was a school teacher in Wolfe County Kentucky for a year. She was in a car wreck at that time and, after her recovery, moved back to the family farm in the mid 1970s. She worked as a social worker and cared for her mother after her father's death. On June 20, 1987 she married a man from Kokomo, Indiana named Gary Steele. He had two daughters. She and Gary and his girls lived in Indiana for four years and then they moved to Mission, Texas where she was a high school guidance counselor until she and Gary divorced in June 1995 and she moved back to the family farm where she once again worked as a social worker until she retired in 2007. Duane Bristow attended the University of Kentucky and graduated the Univerity of Georgia with a Bachelors degree in Forestry in 1968. He worked for the Kentucky Division of Forestry in southeastern Kentucky and he and his wife, Eva, had two boys, David and Chris. In 1979 he returned to care for the family farm and built a house there. Duane and Eva lived there and raised their family. 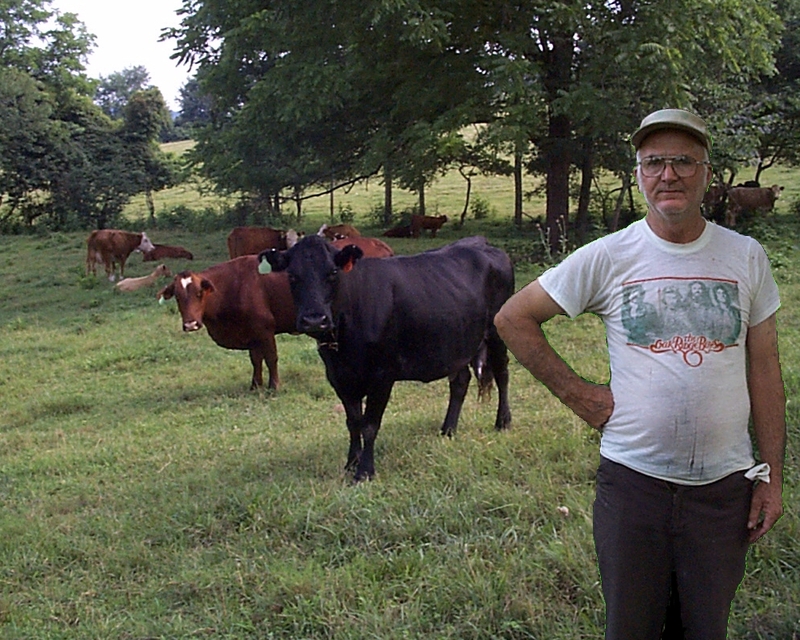 Since 1980 Duane has farmed and worked as a consulting forester and as a computer consultant. He semi-retired in 2012. Duane bought the Mattie Polston place at the location marked 6 in October 1976 and established a hog operation there. He had a farm worker named Earl Stearns and his wife, Sherri, living there in the tenant house, at the location marked 6, for a few years. In the mid 1980s Earl left and Charlie Myers and his two sons, Kenny and John, moved in. Duane made a deal with his neighbor, Gene Wade, to help care for the hogs. For the next few years Duane, Gene, Charlie, Kenny and John farmed the land growing cattle, hogs, tobacco, hay, timber and cutting and selling firewood while Duane worked off the farm in his consulting businesses. 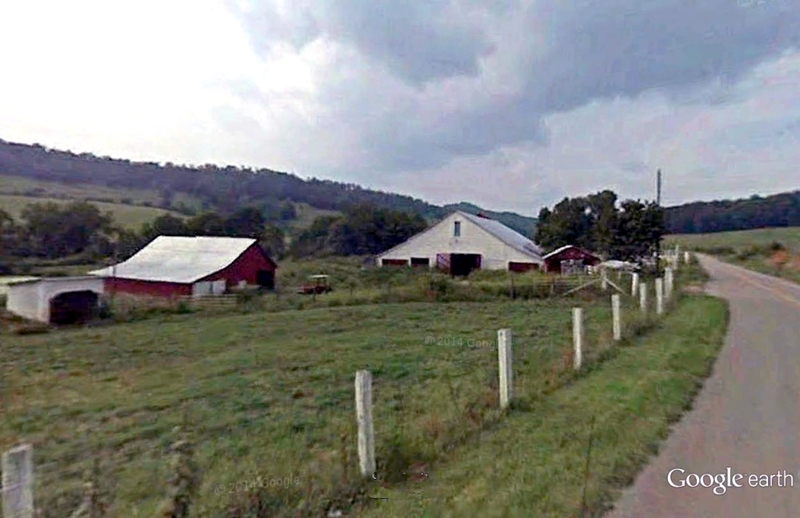 Eventually Gene Wade died and Charlie felt he was too old to work on the farm and moved to live near his now grown and married sons on the Old Burkesville Road. Charlie died in 2012 at the age of 75. Duane and Kenny eliminated the hog operation and the firewood business and eventually the tobacco crop and farmed the land as a cattle and timber operation. Kenny's wife Marie helped Eva Bristow with housework when that became difficult for Eva due to arthritis. In his younger days, when raising his eight children, Charlie Myers had lived in a tenant house on the Knox Upchurch farm and worked on the farm with Knox. That was at the location marked "Upchurch" on the map. Knox upchurch was the son of Rachel Parmley and "Foxy" Upchurch and the grandson of James S. Parmley. In the early 1920s J. H. Cash sold a 4 1/2 acre tract at the location marked 13 on the map to Jake Parrigin (1895-1972). Jake had two sisters, Lizzie born in 1892 and Mattie born in 1897. Jake had a son named J. C. Parrigin born in 1933. Lizzie married John Austin Daniel (1894-1958) and they raised two boys, Homer Jake (1923-1990), and Cecil S. (1927-2013). Cecil never married and lived with Lizzie until she died in 1970 and then lived in New Castle Indiana with Homer and his wife, Mildred, until Homer died. At that point Cecil returned to Albany Kentucky, sold the 4 1/2 acre tract to prepay his funeral expenses and lived in an apartment in Albany until his death. John, Lizzie and Cecil are buried in the Albany Cemetery in Albany, Kentucky. The 4 1/2 acre tract was deeded in 1935 from Jake Parrigin to John Daniel and he and his family lived there until Lizzie's death in 1970. Jake Parrigin's other sister, Mattie (1897-1973), married Henry Polston (1873-1941). In 1927 Mattie bought a 17 acre tract of land located at the location marked 6 on the map from Alex Guinn. This was a part of the F. W. Parrigin 140 acre farm which Parrigin had purchased in 1892 from Wm. Wray and his wife Helen. That F. W. Parrigin farm also included 30 acres owned at one time by W. B. Wright and William and Dora Ann Wray. 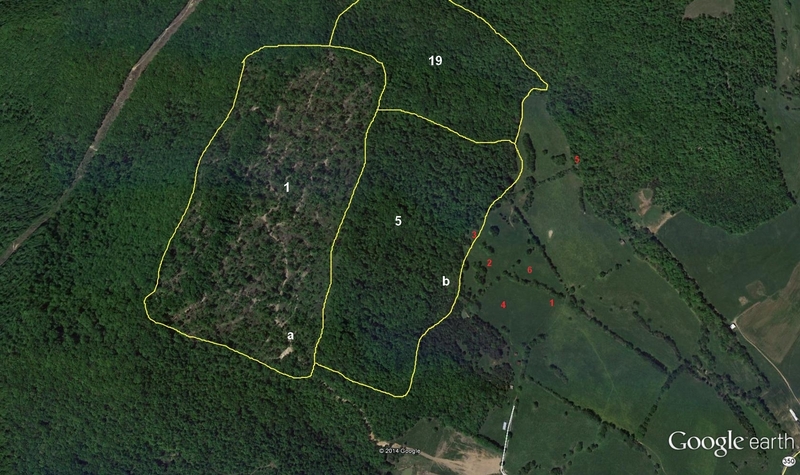 I think the 17 acres where Mattie Polston lived was probably a part of the 30 acre tract. 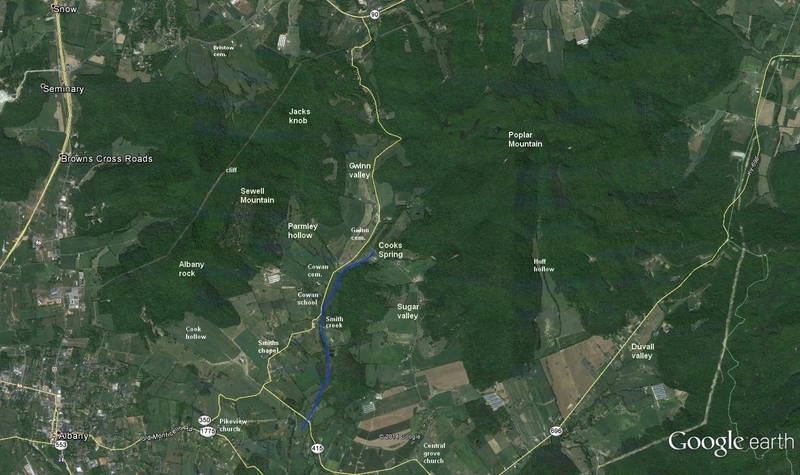 The Wrays got the 140 acre tract from J. F. Brents and his wife M. J. deeded to them in deed book G, page 179. F. W. Parrigin was known as Colonel Parrigin. His daughter, Della (1886- 1967), married Jim Ballenger. After his first wife died, F. W. Parrigin married a woman named Hattie and they had three children together, Jack Parrigin, Marrow Parrigin and Valerie Parrigin. Valerie married an Owens. I don't know how Jake Parrigin and F. W. Parrigin were related. Dan Flowers says that Colonel Parrigin's second wife, Hattie, was a Bruton from Cumberland County. Henry and Mattie Polston raised two children, Cy and Ellen. Cy worked on the Bristow farm as a teenager as did his cousin, Cecil, and later moved to the north to work and, presumably, raise a family. Ellen, who had a reputation as being somewhat "wild" in high school and was called "the flying saucer" for her driving skills, eventually married a man named Carlos Fulton and raised a family in Wayne County Kentucky. Before her death in 1973, Mattie married a man whose name was Kermit Riddle. Jay and Bill Smith and their families lived between Cowan School and Smith's Chapel Church as did their sister Ina Pearl Smith Abbott. Their families were born in the decade of the 1940s and the very early 1950s. Haskell and his wife, Emma, Dalton lived at location 8 on the map. Their daughter, Leta Mae, married Woodrow Gibson and she and her sister, Lucille, had a number of children, many of whom, live in Clinton and Wayne counties, particularly in the Cartwright area. When they were teenagers and young men, I remember Glenn and Paul and Shelby working on the Bristow Farm in the 1950s. Paul was also a part owner of a TV repair shop in Albany at that time. Later all the boys moved to the North to find work. After Haskell Dalton's death that farm was purchased by Millard Lee. After Millard Lee's death the farm was sold to Kenny Denney and his family. Clinton County, Kentucky, to Isaac L. and Louisanna (Cecil) Dalton. On Nov.
and burial will be in Sharpsville Cemetery. was a tool maker and supervisor, working at AVCO and retiring from Nixon Tool. Dalton; and sisters, Leta Mae Gibson, Lucille Dalton, and Wilma Spearman. Kentucky to the late Joe Haskel and Emma (Cooksey) Dalton. thank HCMH and Hospice for the special care given at this difficult time. Florida; two great grandsons, Troy and Drake. In addition to his parents he was preceded in death by 8 brothers and sisters. in South Mound Cemetery, West Lawn Addition. Kentucky, a son of the late Lewis and Bertha (Bristoe) Vitatoe. especially loved flowers and baseball, and was an avid Colts fan. grandchildren; several nieces and nephews. 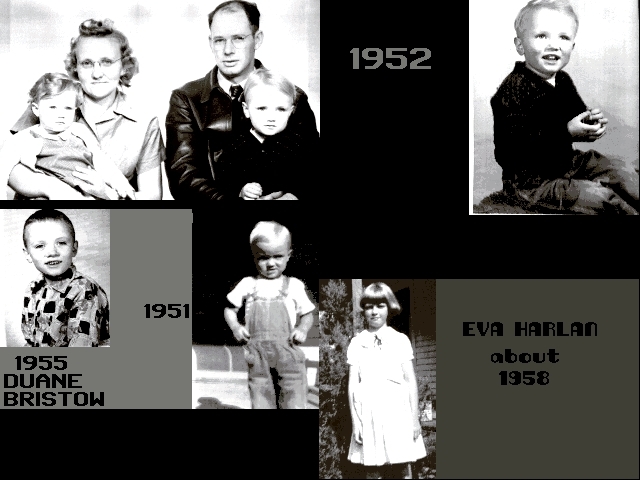 Herbert, Haskell, Virgil, and Earl Vitatoe, and a sister: Edna Pierce. with Bro. Bobby Slagle officiating. Burial in South Mound Cemetery. On the hill above Haskell Dalton's log cabin and across the Old Monticello Road at the place marked 14 in a white frame house with 3 gables lived Haskell's brother, Bob Dalton, and his wife, Wilma. In 1951 they sold their farm to Selbert Byers and his wife, Ermon Hayes Byers. Selbert also bought 140 acres behind that and the 4 3/4 acre tract where Duane Bristow now lives from Beecher Smith and his wife, Verdie. He also had bought 38 1/2 acres from Dr. S. W. Bristow in January 1944. This land of Beecher Smith's was deeded to him in 1892 from W. C. Wray bk. K, pg. 157. Selbert Byers sold the 4 3/4 acre tract to Jesse W. Bristow in 1955. That is the place marked 3 and 5 on the map. He also sold the Beecher Smith 140 acre tract to A. P. Guinn and Walker Gibson that year. (Deed book 39, page 176). Gibson was Guinn's cousin. There is a house there at the place marked 7. Selbert's son, J. T. lived there while Selbert owned the place. Later Walker Gibson and his family lived there followed by Danny Russell and his family. When Walker Gibson died his farm was divided between his two sons-in-law, Danny Russell and Gene Wade. After Gene Wade died in 1998 at the age of 70, most of his part of the farm was sold to Jason Ferguson by Gene's son, Doug. See Gene Wade's grave here. The 140 acre tract that Selbert Byers bought from Beecher Smith was probably owned by Frank W. Parrigin in the early twentieth century. Selbert Byers sold the Bob Dalton tract to Raymond Irwin and his wife, Ina, in January 1958 and Selbert moved his family to the Central Union community which is now called Central Grove. 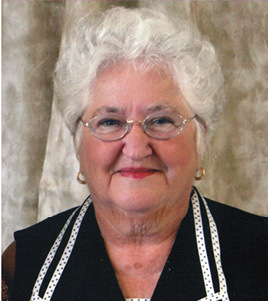 Betty Eula Byers Piercey Sutton, 71, Albany, passed away Sunday, May 8, 2011 at her residence. She was the daughter of the late Selbert and Ermon Hays Byers and wife of the late John Marion Piercey. She was a member of Albany Eastern Star. She is survived by her husband, Hermon Sutton; a daughter, Brenda K. (Charles) Orton, Albany; nine brothers and sisters, J.T. (Charlene) Byers, Nadine (Don) Dalton, both of New Castle, IN; Arthur (Rachel) Byers, Greenfield, IN; Earl (Susan) Byers, Frankfort, KY; Elaine (Michael) Craft, Somerset, KY; Mary (Larry) Brown, Lois (Bobby) Thrasher, Stevie (Anna Ruth) Byers and Weldon (Marilyn) Byers, all of Albany; three grandchildren, Ocie (Ricky) Marcum, Anthony Orton and Jonathan (Heather) Orton; three great-grandchildren, Christian and Caleb Marcum and Jaxon Albertson; a special nephew, Randy (Crystal) Jones and several other nieces and nephews. 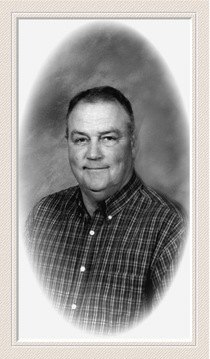 Funeral services were held Wednesday, May 11, 2011 at 1 p.m. at Campbell-New Funeral Home with Bro. Larry Brown and Bro. Larry Jones officiating. Final resting place in Peolia Cemetery. Arrangements made through Campbell-New Funeral Home of Albany. Condolences may be made at www.campbell-new.com. The story is that a man from Clinton county named Jack (no last name is given) fought in the War of 1812 in the battle of New Orleans. With the war over, Jack walked from New Orleans back to Kentucky, much of his journey along the Natchez Trace. 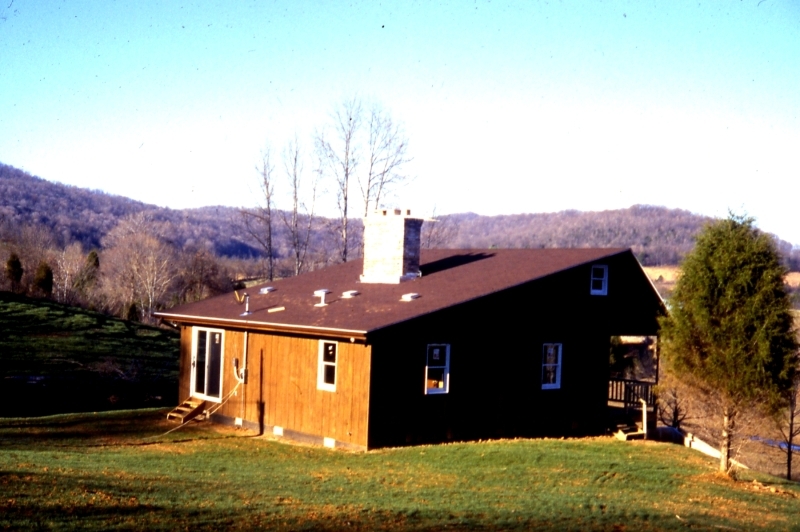 When Jack returned to Clinton county, it is said that he built a cabin on the top of a knob where he could see over a large area. He lived there the rest of his life raising and lowering the American flag each day. So everyone in the community began calling the place "Jack's Knob". The place marked 9 is the location of the house where James Byers lived with his family from 1910 to 1920. 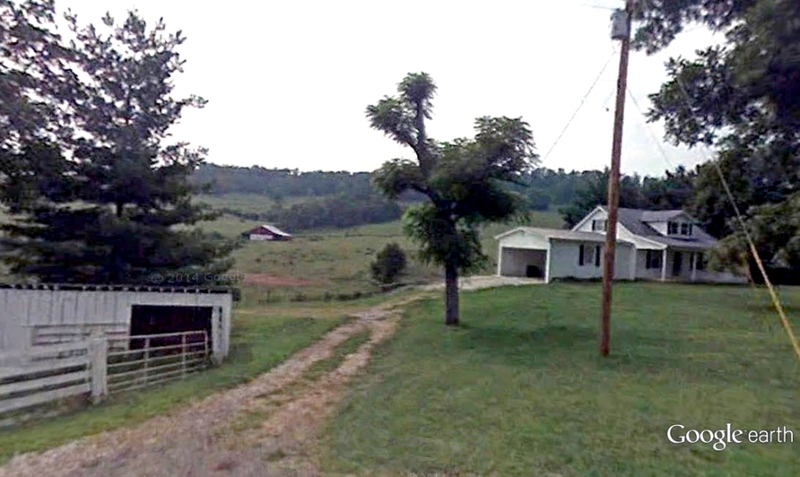 This is the farm where Geneva Byers cared for Dan Davis after his surgery. 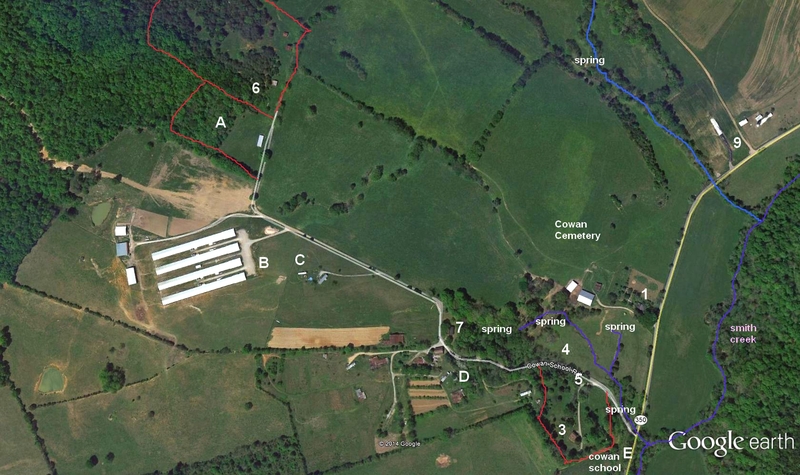 The location marked 1 is probably the location of the Cowan's farm house. Later Perry Cash had a house and ran a country store at this location and in 1950 Jesse Bristow with the help of Haskell Dalton and his boys built a home for his family there. Karen Bristow lives there now. The photo shows the barn and two sheds just to the west of the house. The location marked 4 is the site of a tenant house probably built by Perry Cash. It was called the Logan house. I don't know why. We took it down years ago. Across the road from the Logan house James Cummings and Thelma built a small house and raised their family. Barbara Russell says that, at one time, Walker Gibson's brother and his parents lived in the house at the place marked 5 on the map above. That house has not existed for the last 60 years. E marks the location of the Cowan one room school. Duane attended the first 8 grades of school there from 1953 to 1960. 3 is the house Duane Bristow had built by the Shelton Brothers in 1979 and where he and Eva raised their two boys. It is located on the 4 3/4 acre lot purchased from Selbert Byers by Jesse Bristow in 1955. That lot is a hillside below the school. D marks the Russell compound, a conglomeration of houses, trailers and other buildings built by the Russell and Wade families including the house trailer at C where Doug Wade's ex-wife and children live. Walker Gibson raised his family in a house at this location but that house has been replaced. 7 marks the location of Gene Wade and Christine's house. B marks Jason Ferguson's chicken houses. He bought the land from Doug Wade and built them in the early 2000s. A is an area owned by Perry Cash which was the site of three or four houses in the late 1800s or early 1900s. All that is left now is foundation stones. I am unsure who lived there and when. The building on the photo is a hog farrowing house built by Duane Bristow and the Shelton Brothers in 1980. 6 marks the location where Mattie Polston lived on a 17 acre tract of land. She and her husband Henry Polston raised two kids, Cy and Ellen, there. Chris Bristow atop the cliff under the power line on Sewell mountain - north is behind him. Please note that the pictures below are courtesy of Mrs. Loretta Guinn. 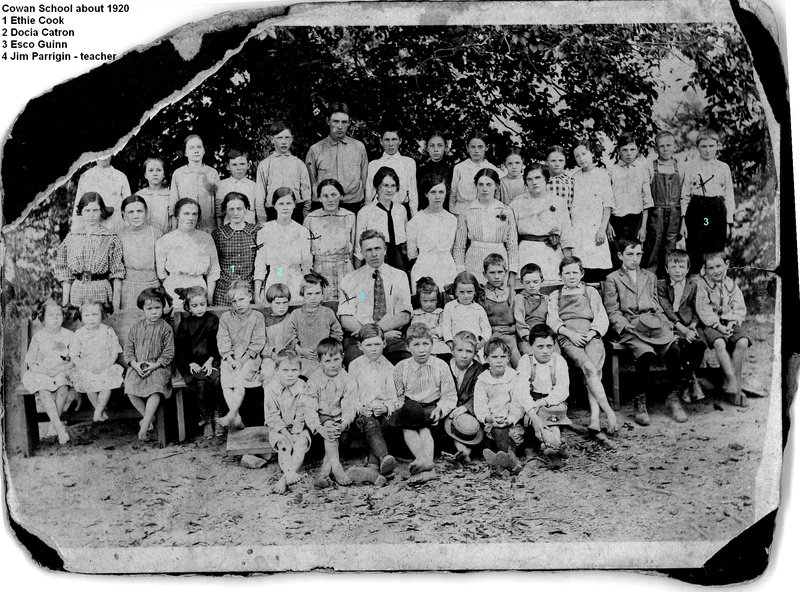 The teacher and students at Cowan School in about 1920. Threshing wheat on the Dr. David Cook farm in the Cook hollow in the early 1900s. Mary Alma Burchett Cook, wife of Dr. David L. Cook. Dr. David L Cook (on left) and family? Probably on the front porch of his house. 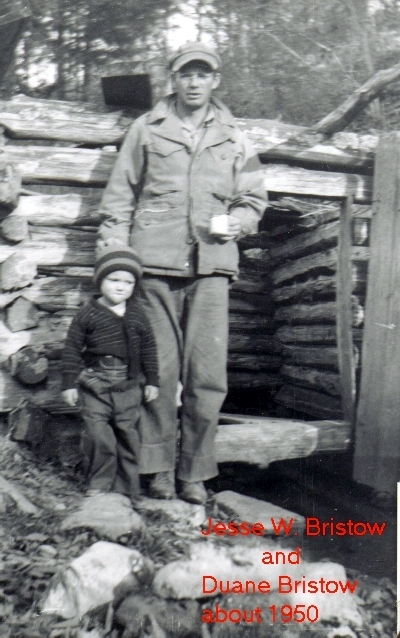 James W. Parrigin (1882-1949) holding his son, James Cook Parrigin (1924-2011). Ethie Cook and her younger brother, Glenn. There is some oil at the knox formation about 1800 feet down in the valley. Oil exploratory holes were drilled in the late 1950s and again in the 1980s and 1990s. Three holes drilled hit some natural gas and two hit oil. Two more were dry holes. One of the holes where oil was hit had salt water mixed with the oil and the other was never put into production although it did produce one or two tanker loads of oil. 1200 foot hole drilled by Sun Oil Co. in late 1950s - much gas hit and burned off. 1800 foot hole drilled in the early 1980s by Cheyenne Oil Company. Oil hit but company went out of business - About two tanker loads sold. Some gas. 1800 foot dry hole drilled in later 1980s by Ewert Wilson - before it came in I sold half my interest for $1,000. 1800 foot dry hole drilled by Ewert Wilson at same time as the one above - gas hit and rig burned. 1800 foot dry hole drilled in late 80s or early 90s. 1800 foot dry hole drilled in later 1980s by Ewert Wilson - hit oil and salt water. 1 - area cut over after one year by landowers and loggers who did not care about the land. 5 - a selective cut after 5 years by people who cared. 19 - a selective cut after 19 years by people who cared. In the picture below the left side was taken at the place marked "a" on the picture above and the right side was taken at "b". 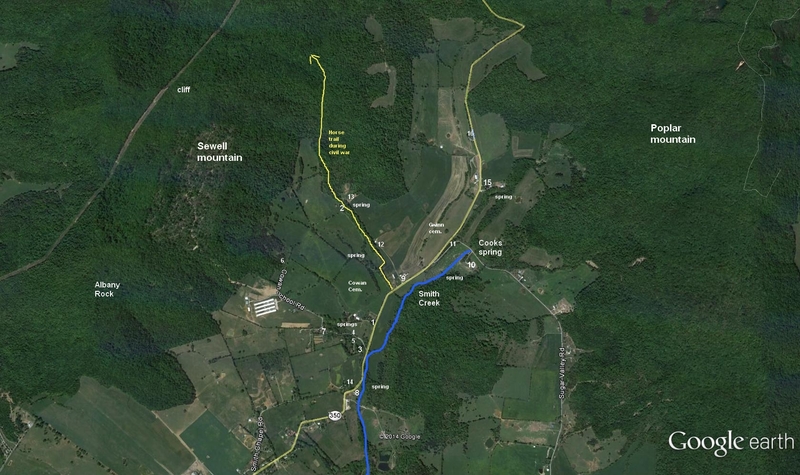 Sewell Mountain has a dirt road along its top accessed from Albany and, as you can see in the maps above, a power line running across it. 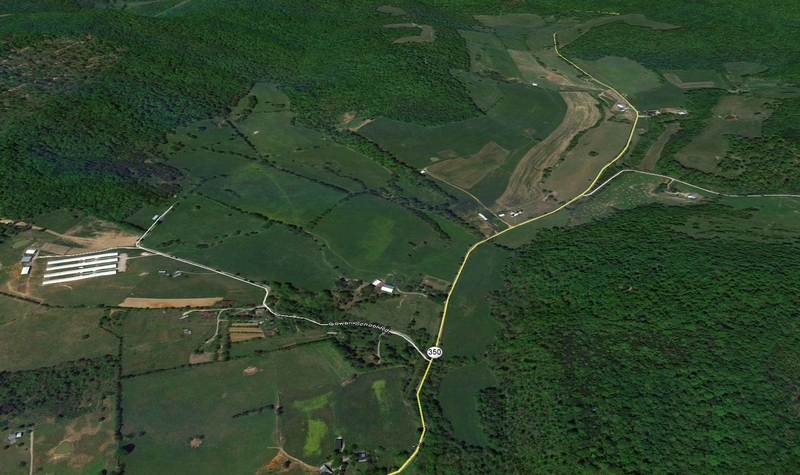 On the northeast end of Sewell Mountain above the Jimmy Fox Upchurch farm there is a sandstone cliff where the power line crosses the mountain. To the east of this cliff not too far from the foot of the cliff is a sulphur or mineral spring, now just a small seep from the ground. In the early part of the twentieth century there was a building at this spring. A few years ago some of the foundation stones of this building could be found there and, as far as I know, they are still there today. My understanding is that this building was a hotel or resort to which people came from far away to stay for days or weeks to partake of the supposed healing properties of this water, I suppose, used for drinking and bathing. According to David Cross, a local attorney, it was called Rehobath Springs. He says it was first built by Joseph Sewell and the Griders and Parrigins operated it for years. Cy Parrigin was the proprietor for some time. 1801-04-01 - George Gwinn born in Virginia. other families from Monroe county Virginia (now West Virginia). 1808-05-05 - Rachel Cowan born to David Cowan. 1809-02-27 - Jane Davis born in Kentucky. 1812-08-23 - Thomas A. Cowan joined the Army. 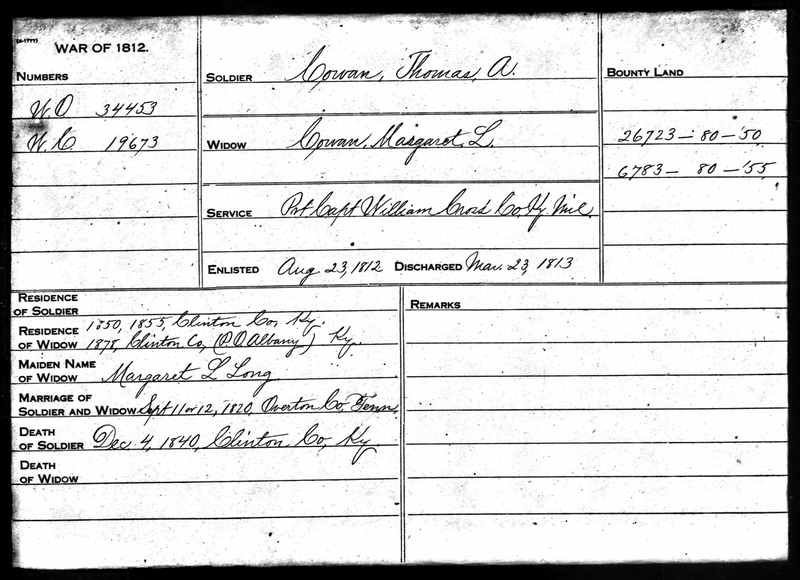 1813-08-23 - Thomas A. Cowan discharged from the Army. 1825-02-03 - George Gwinn marries Jane Davis in Alpha, Wayne county Kentucky. 1827-12 - George Gwinn receives 200 acre land grant on Smith Creek. 1826 to 1852 - The Gwinn's have 10 children. 1831-12-31 - James S. Parmley born. 1832-11-28 - George W. Gwinn born. 1836-02-20 - Clinton County formed from portions of Cumberland and Wayne. 1845-03-28 - Ann Eliza Pierce born. 1852-09-01 - Mary Elizabeth Wood born to William Cargile Wood and Luverna McGee in Fentress County Tennessee. 1863 - Frank Wolford Parrigin born. 1866-09-26 - George W. Gwinn marries Elizabeth Gibbons Wood. 1868-08-04 - George A. Gwinn born deaf. 1872-08-13 - Ellen Bruton born. 1873-08-01 - George Gwinn dies and is buried in Gwinn cemetery. 1873-08-07 - Elizabeth Gibbons Wood Gwinn dies and is buried in Gwinn cemetery. her husband, George W. Gwinn later married her cousin, Mary Elizabeth Wood. 1875-02-16 - George Grider born. 1876-04-02 - Jane Davis Gwinn dies and is buried in Gwinn cemetery. 1878 - Margaret Cowan once again living in Kentucky. 1881-01-08 - Orestes Smith Grider born. 1882 - Mary Alma Burchett born. 1890 - William J. Cowan, Sr. dies & probably buried in Cowan Cemetery. 1890-07-07 - Lewis Pierce dies. 1891 - Dan Davis born. 1892 - Margaret Cowan dies in Kansas. 1892 - Perry Cash born. 1892 - James W. Parrigin born. 1892 - Lizzie Parrigin born. 1892-03-23 - David C. Cowan dies and is buried in Albany Cemetery. 1894 - John Austin Daniel born. 1895 - Jake Parrigin born. 1897 - Mattie Parrigin born. 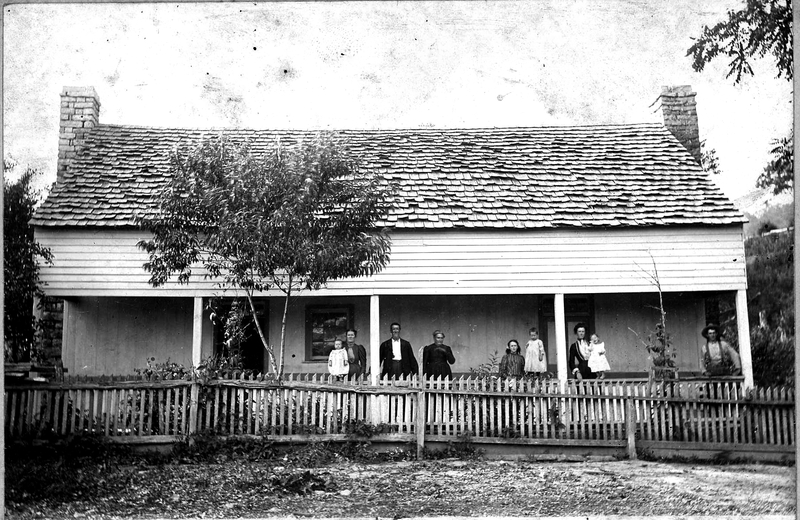 1896 - John C. Burchett's heirs sell the "Bal Vitatoe" farm to George R. G. Stinson. 1900-12-26 - Walker Gibson born. 1902 - Ethel Reba Cook born. 1902 to 1916 - David Lewis Cook and Mary Alma Burchett's 4 children born. 1903-05-16 - Joe Haskell Dalton born. 1906 - Henry Stinson sells the "Bal Vitatoe" farm to G. C. Clark and Fred and Antha Elrick. 1907 - Jay W. Smith born. 1907 - Bob Dalton born. 1908 - Anges Bell Hopkins Parrigin dies. 1910 - Armilda Byers buys the "Bal" Vitatoe farm. 1910-05-22 - Selbert Byers born. 1911 - Bill Smith born. 1913-08-26 - Glenn B. Cook born. 1916 - Charlie D. Cook born. 1919 - Ina Pearl Smith born. 1920-09-18 - George W. Gwinn dies in Cumberland County Kentucky. 1920-02-21 - Woodrow Gibson born. 1921 - S. J. Wray sells the "Bal" Vitatoe farm to J. H. and Lula Cash. 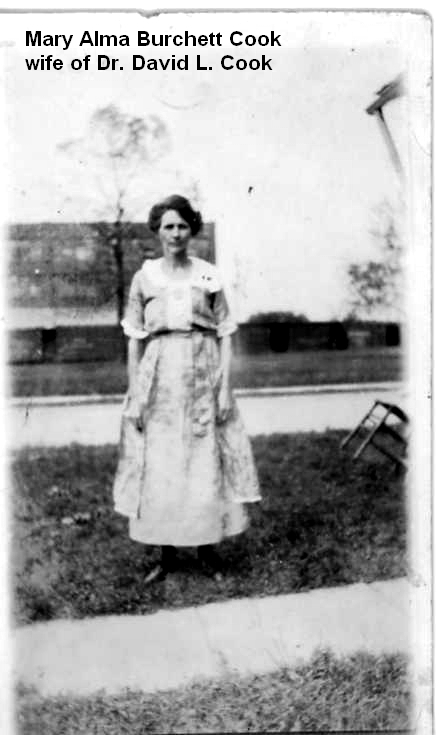 1921-03-20 - Elizabeth Ann Pierce Parmley dies. 1924-10-31 - James cummings born. 1924-12-24 - Leta Mae Dalton born. 1925 - The Cashs sell the "Bal" Vitatoe farm to Welby R. Gist. 1927 - Cecil S. Daniel born. 1927 - Mattie Polston buys 17 acre tract from Alex Guinn. 1928 - Thelma Gibson born. 1929-02-21 - Lucille Dalton born. 1930-04-12 - Glenn Dalton born. 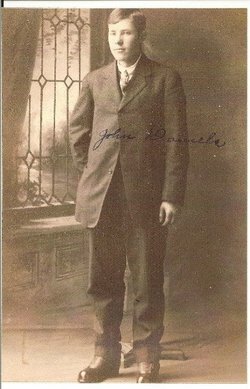 1931-04-12 - John Lyons dies. 1933 - J. C. Parrigin born. 1934 - Geneva Byers Davis dies. 1934 - Harold G. Parrigin born. 1935 - Jake Parrigin deeds 4 1/2 acre tract to John Daniel and Lizzie. 1936 - Welby R. Gist sells the "Bal" Vitatoe farm to W. B. "Bal" Vitatoe. 1939 - Sarah Wray Cowan, widow of Bill Cowan, Jr. dies. 1940-06-16 - George A. (deaf George) Gwinn dies. 1940-11 - Wendell Maupin buys 1040 acres of timberland from the Gwinns for $5,000. 1941 - Henry Polston dies. 1942-02-17 - Charlie D. Cook and his infant daughter killed in a house fire. his son, also named Charlie D., was born to his wife, Franklin, after his death. 1944 - F. W. Parrigin dies. 1947-08-29 - Duane Bristow born to Jesse W. Bristow and Nora Lafever. 1949 - James W. Parrigin dies. 1949-12 - Wendell Maupin sells 1040 acres of timberland on Poplar Mountain to Bruce Sloan for $7,000. 1951 - Selbert Byers buys the F. W. Parrigin farm. 1955 - Selbert Byers sells his farm, part to Raymond Irwin and most to Walker Gibson. 4 3/4 acres went to Jesse Bristow. 1957 - Emma Cooksey Dalton dies. family move to Central Grove. 1894 - John Austin Daniel dies. 1959 - Mary Alma Burchett Cook dies. 1970 - Lizzie Parrigin Daniel dies. 1970-07-08 - David Jesse Bristow born. 1972 - Jake Parrigin dies. 1973 - Mattie Parrigin Polston dies. 1974-09-27 - Lillie Maupin, wife of Wendell Maupin, dies. 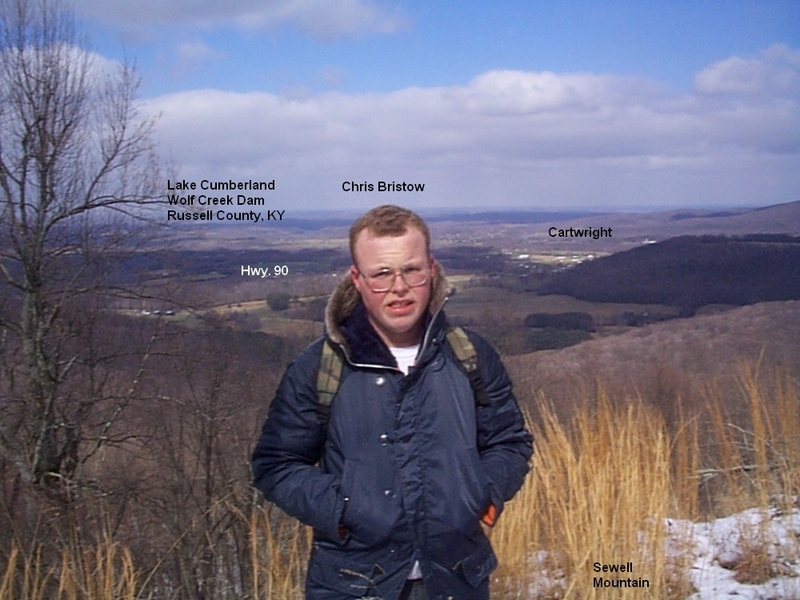 1977-12-13 - Christopher Michael Bristow born. 1978-05-24 - Selbert Byers dies. 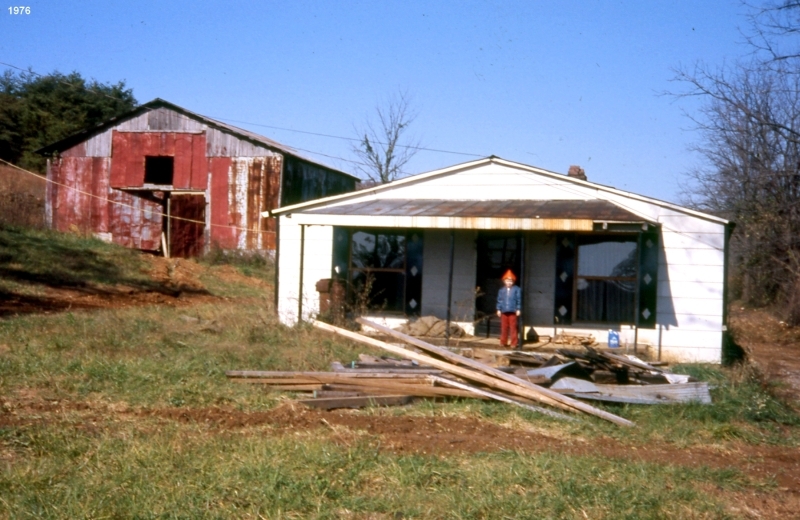 1979 - Duane Bristow builds his house near the Cowan School. 1985-01-25 - Woodrow Gibson dies. 1988 - Jay W. Smith dies. 1988-09-26 - Glenn Cook dies. 1989 - Ethel Reba Cook Parrigin dies. 1994 - Harold G. Parrigin dies. 1994-09-18 - Nora Lafever Bristow dies. 1996-01-23 - Lucille Dalton dies. 1997 - Bill Smith dies. 1997 - Ina Pearl Smith Abbott dies. 1998-05-14 - Thelma Gibson Cummings dies. 2007 - Ruby Parrigin dies. 2015-01-03 - Glenn Dalton dies in New Castle, Indiana. The descendents of Margaret Bristow submitted by Michele Norton. 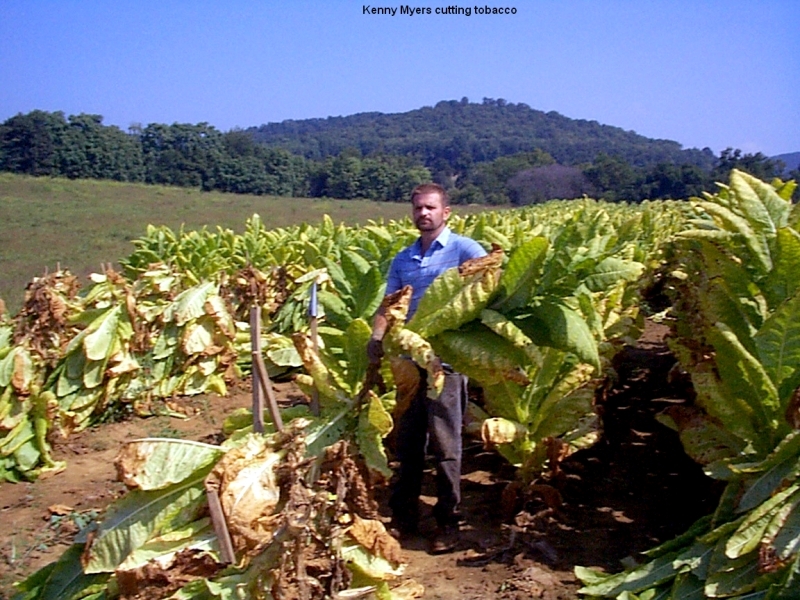 Our Farm Photos or Farm Photos page 2 - Tobacco or Even more farm pictures. George W.,  Martha E., Orestes Smith, and Mary E.
Issac V. Cowan, Andrew Cowan's grandson. Alias: Van Buren Cowan. 4 3/4 acres below Cowan School. 04-11-1922 - From Sarah S. Cowan to Fratie and Roscoe Sloan - Bk. 12, pg. 292.